Homeland defense officials are reviving enforcement of a law that is intended to bar legal migrants who cannot earn a living in the United States. The administration is committed to enforcing existing immigration law, which is clearly intended to protect the American taxpayer by ensuring that foreign nationals seeking to enter or remain in the U.S are self-sufficient. Any proposed changes would ensure that the government takes the responsibility of being good stewards of taxpayer funds seriously and adjudicates immigration benefit requests in accordance with the law. Immigrants who accept almost any form of welfare or public benefit, even popular tax deductions, could be denied legal U.S. residency under a proposal awaiting approval by the Trump administration, which is seeking to reduce the number of foreigners living in the United States. According to a draft of the proposal obtained by The Washington Post, immigration caseworkers would be required to consider a much broader range of factors when determining whether immigrants or their U.S.-citizen children are using public benefits or may be likely to do so. The proposal would also require Americans who sponsor migrants to post bonds of up to $10,000, which could be used to repay taxpayers for migrants’ use of federal aid. The plan must be approved by DHS Secretary Kirstjen Nielsen, and then undergo a months-long public comment and regulatory process before it becomes a large regulation. If adopted, it will replace a 1999 regulation. (1) Self-sufficiency has been a basic principle of United States immigration law since this country’s earliest immigration statutes. (2) It continues to be the immigration policy of the United States that— (A) Aliens within the Nation’s borders not depend on public resources to meet their needs, but rather rely on their own capabilities and the resources of their families, their sponsors, and private organizations; and (B) The availability of public benefits not constitute an incentive for immigration to the United States. 4 Generally, aliens in the United States who receive or use public benefits are dependent on Federal, State, and local governments for support. The receipt or use of public benefits by aliens subject to public charge inadmissibility is contrary to section 212(a)(4) of the INA, 8 U.S.C. 1182(a)(4), and to policy statements made in 8 U.S.C. Progressives oppose the measure and argue that immigrants use welfare at the same rate as Americans. Immigrant-headed households use 41 percent more federal welfare benefits than their native-born counterparts, according to a new Center for Immigration Studies analysis of U.S. Census Bureau data. Broken down by category, author Jason Richwine details how immigrant-headed households consume on average 33 percent more cash welfare (Supplemental Security Income and Temporary Assistance for Needy Families), 57 percent more food assistance (food stamps, the Women, Infants, and Children program, and school lunch), and 44 percent more Medicaid. Both groups, however, use housing assistance at similar levels. Many immigrants — including illegal immigrants – work very hard and will give up welfare aid if it threatens the immigration process. 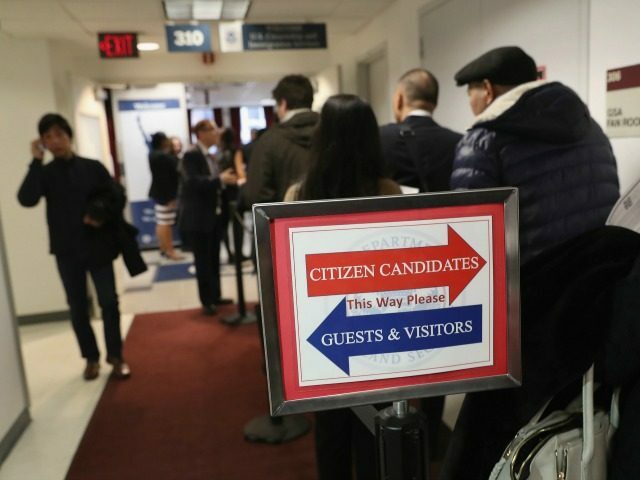 However, the Democratic Party and its allies in aid and welfare groups stand to lose funding and influence if they cannot offer taxpayer welfare to migrants. Immigration reformers welcomed the plan. “We shouldn’t be taking in anyone from abroad who can’t support himself & his family,” said a tweet from Mark Krikorian, director of the Center for Immigration Studies. Progressives oppose the draft plan. Any draft documents circulating internally are considered pre-decisional and have not been approved for submission to the Office of Management and Budget … Upon publication in the Federal Register, USCIS encourages public comments on this proposed rule. No final decision will be made until the rulemaking process is complete. Per the rulemaking requirements, we are unable to discuss the contents of the proposed rule.